Cancer is a hugely complex disease where the interplay between genomics, epigenomics and transcriptomics has been shown to play an importance role in development of the disease, as well as in prognosis of patients and response to treatments. Only through a thorough understanding of the underlying biology will we be able to answer the most important questions facing the field of cancer biolgy. To better understand the epigenetic control in breast cancer by identifying transcription factor networks that are regulated by epigenetic modifications such as DNA methylation and histone modification. Identify prognostic and predictive biomarkers that may improve the selection of treatments for breast cancer patients. In our group we utilize powerful bioinformatic and statistical approaches to analyze omics data (genomics, epigenomics, transcriptomics and other) for big patient cohorts with comprehensive clinical data. DNA methylation is one of the mechanisms that regulate gene expression and it has been shown to be important in cancer. In our project group we study changes in DNA methylation in cancer (breast, rectal and lung) genome wide looking for prognostic markers as well as markers that predict treatment response. Additionally we investigate the biological contribution of DNA methylation in cancer development and progression, and we do integrative analyses using data such as gene expression, germ line genotype and tumor copy number. Can DNA methylation classify breast cancer? Can DNA Methylation be used to further subdivide subclasses? Figure 2.SAM40 is a DNA methylation signature that segregates Luminal A patients based on prognosis. Can DNA Methylation separate invasive from in situ brest cancer ? Can DNA Methylation predict prognosis in DCIS and Invasive Breast cancer? How is DNA Methylation associated to gene expression? Do DNA Methylation- gene expression associations (emQTLs) have classification value? Genome-wide expression-methylation quantitative trait loci (emQTL) analysis between DNA methylation and gene expression identified a regulatory network related to estrogen receptor (ER) signaling that was altered by DNA methylation in breast cancer. We identified lineage specific differences in methylation at enhancers carrying transcription factor binding regions, which correlated with distinct expression of experimentally validated target genes of the transcription factors ERα, FOXA1 and GATA3. The heatmap shows CpGs in binding sites of ERα, FOXA1 and GATA3 being highly methylated in ER negative tumors and lowly methylated in ER positive tumors. The alteration of the DNA methylation at the TF binding regions could be considered an early event during normal breast cell transformation into estrogen dependent tumor cells. 1. Jo Anders Rønneberg 30.06.2010; Title of the thesis: DNA methylation analysis of primary breast tumors: from single genes to microarrays. 2. Thomas Fleischer 20.06.2014; Title of the thesis: Epigenetic alterations in breast cancer: implications on classification and prognosis. 1. DNA methylation signature (SAM40) identifies subgroups of the Luminal A breast cancer samples with distinct survival. 2. Tumour hypoxia causes DNA hypermethylation by reducing TET activity. 3. Heterogeneous DNA Methylation Patterns in the GSTP1 Promoter Lead to Discordant Results between Assay Technologies and Impede Its Implementation as Epigenetic Biomarkers in Breast Cancer. 4. Integrated analysis of high-resolution DNA methylation profiles, gene expression, germline genotypes and clinical end points in breast cancer patients. 5. 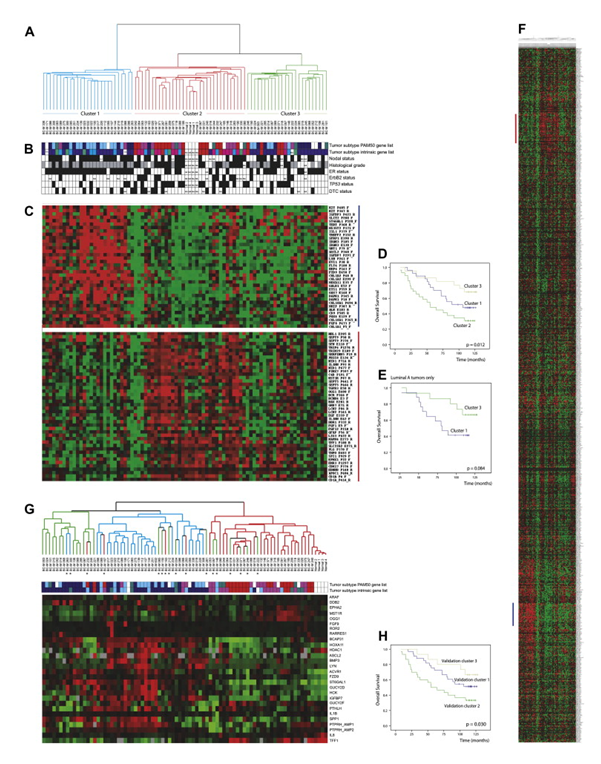 Genome-wide DNA methylation profiles in progression to in situ and invasive carcinoma of the breast with impact on gene transcription and prognosis. 6. Quantitative DNA methylation analyses reveal stage dependent DNA methylation and association to clinico-pathological factors in breast tumors. 7. Methylation profiling with a panel of cancer related genes: association with estrogen receptor, TP53 mutation status and expression subtypes in sporadic breast cancer. 8. The epigenetics of breast cancer. 9. GSTP1 promoter haplotypes affect DNA methylation levels and promoter activity in breast carcinomas.